Even a small change to farm configuration or site permissions could lead to data exfiltration or bring your business to a screeching halt. What if a suspicious change slips by without you spotting it? Risky, isn’t it? Streamlined SharePoint Online auditing enriched with insightful reporting will minimize that risk. Stress no more, because you can audit everything that’s going on your SharePoint Online and get top-to-bottom visibility into any change and access. As a result, you can be sure you won’t be too late to respond effectively to insider or outsider threats, because you can identify and investigate them faster. In addition to protecting your data and ensuring business continuity, you’ll also be well-positioned to provide required evidence at your next compliance check. Be ready to spend your precious time digging out the specific details of changes or access events because the search filtering options are limited. Moreover, the raw audit data can be cryptic, so it can be a nightmare trying to put the pieces of the puzzle together. There are only a few predefined reports, so you’ll expend lots of effort and time using the search function, exporting results into Excel or another format, and then sorting and formatting the data. 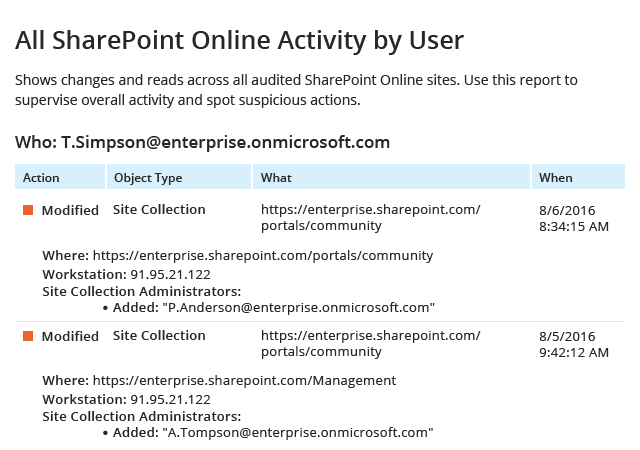 Since there are no SharePoint Online report subscriptions, you have to manually generate reports whenever you or someone else needs them. The Office 365 Security and Compliance Center provides no storage options, so you’ll have to figure out where you are going to store all your audit intelligence and how to ensure you’ll be able to easily access it when you need it. Spend less time detecting and remediating insider and outsider threats. A broad variety of ready-to-use predefined reports and multiple filtering options deliver every detail of every action. Slash the time you spend on reports generation. Simply subscribe to the specific reports you need, and they will be delivered to you automatically on the schedule you set. Investigate aberrant activity in minutes with the Interactive Search feature. Be the first to know about critical activity by setting up custom alerts. Worry no more about where to keep your audit data. You can store your SharePoint Online logs for over 10 years in a cost-effective two-tiered storage (SQL database + file-based), and easily access them at any time, whether for another audit or an in-house security investigation.